This superbly decorative lectern consists of a fine quality cast eagle with outswept wings supported on a sphere or globe with pierced foliate bookrest with monogram 'HS' - we believe to be Hart & Son, London (later to become Hart, Son, Peard & Co). The eagle is supported by a spiral twist column leading down to a stepped circular base with pierced flower and cross designs displaying the wording 'To the Glory of God' and terminating with three paw feet. The company Joseph Hart & Son was set up in 1840 by Joseph Hart in London, the company manufacturing artistic metalwork specialising in ecclesiastical items. In 1853 he took on a young man, Thomas Peard - Peard subsequently left in 1860 to start his own business and was joined by Frederick Jackson. In 1866-67 the two companies united as Hart, Son, Peard & Co exhibiting in many of the major exhibitions of the time and won awards in London, Paris, Dublin and Philadelphia. 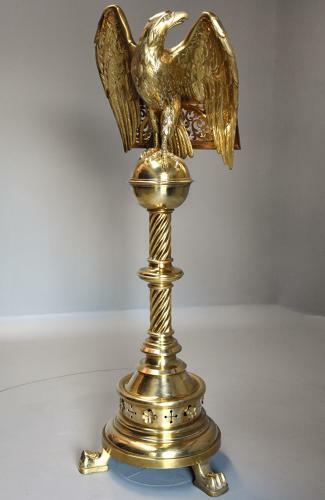 Many Anglican churches were adorned with eagle lecterns, the origin going back over a thousand years although many brass eagle lecterns being products of the Victorian Gothic revival and the bookrest being used to display the Bible. The eagle represents St. John the Evangelist, writer of the first Gospel, although can also be a representation of the resurrection and ascension of Christ, also the eagle with outspread wings on a pole was a symbol for victory since the Roman period. This wonderful quality lectern is in excellent condition for age, is of stable construction and can go straight into a home etc - an ideal item for displaying important books, bibles, menus etc.